Home Free Windows 7 Tricks Windows Tricks DOWNLOAD: Free Official Windows 7 Themes. 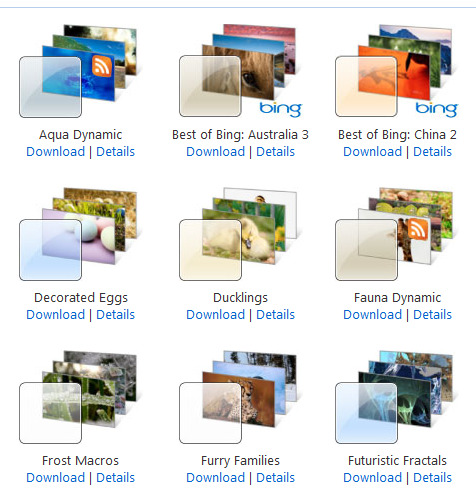 DOWNLOAD: Free Official Windows 7 Themes. Windows 7 comes with really cool default themes. Just in case you have an appetite for more themes and that too for free then there is a great NEWS for you. There are free themes available for Windows 7 Home Premium, Professional, Enterprise, or Ultimate editions. You can choose from hundreds of these free themes available which belong to categories like Animals, Art, Automotive, Branded themes, Games, Holidays and seasons, Movies, Nature Places and landscapes. Just follow below steps to get them now. 2. Just click Download and Open. 3. This will simply apply the theme on your computer. Simply try out many themes if you didn't like the one you downloaded.